The figure above shows the R&D Intensity in EU Member States. R&D Intensity is defined as the Gross domestic expenditure on R&D (GERD) as % of GDP. Member States, Turkey and Croatia. 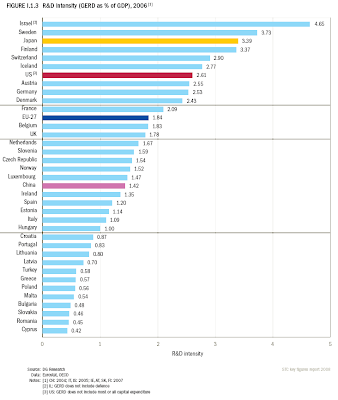 Greece's R&D Intensity was 0.57 in 2006 when the EU-27 average was 1.84%; ranked 21st in EU-27. In 2004 Greece's R&D Intensity was 0.6% and EU-25 average was 1.8%; ranked 21st in EU-25. The target for 2010 is set to 1.5% (EU-25 estimate: 2.6%).